Where is the stimulus New Zealand? Economic and labour market commentators, including government departments and the Reserve Bank, have been forecasting for at least the last year and a half that employment would 'continue' to recover gradually. This hasn't happened. Employment is flatlining, and government efforts to stimulate a recovery are indiscernable. The Canterbury rebuild will happen. Eventually that will increase employment in construction, at least in this region, with flow-on effects to employment in other industries, but again, mainly in Canterbury. Agriculture produce will likely continue to enjoy historically high prices, providing Chinese growth continues, but much of the employment growth in this increasingly productive industry has been had. It should be possible to get greater leverage off of the premium that should be had from agriculture products 'made in New Zealand' - given China's unquenchable desire for these. 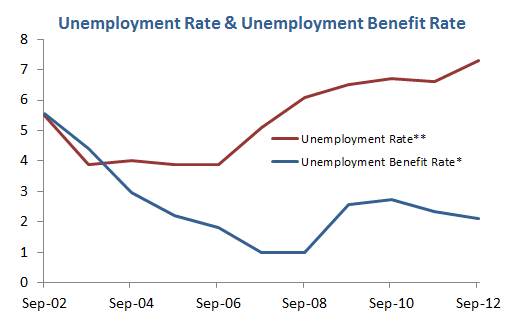 But so far there's little evidence of this or of it contributing to greater employment. So where is employment growth going to come from? The public sector isn't growing anymore - the government's seen to that (except for health, which always grows, but steady health growth doesn't result in the expansionary growth needed in other sectors). That leaves us with the government's passive strategy of 'providing the conditions for business growth'. Unfortunately, this may not be enough. Even an astounded Daily Express can't get the increase in Polish immigrants to the UK right. It wasn't an 89% increase from 2001 to 2011, it was a truly astounding 890% increase, to well over half-a-million. That is an almost nine-fold increase in just ten years, in fact, more like six years, as Poland was only admitted to the EU in 2004. Overall, 7.5 million migrants live in the UK, up from 4.6 million ten years ago - a 63% increase. And in 2014, the EU will open up the UK's borders to twenty million more people, as Bulgaria and Romania fully enter the union. 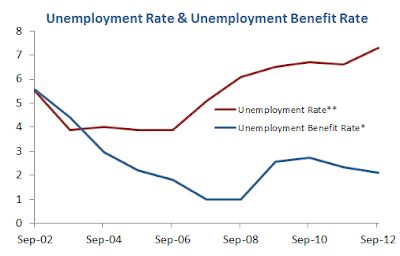 New Zealand Government performs miracles, raising the unemployment rate while lowering the benefit rate. Is that why we have more beggars on the streets? "17. Mandatory Work Activity will be part of the toolkit that Jobcentre Plus advisers will have available to them. Where advisers believe a jobseeker will benefit from experiencing the habits and routines of working life, they will have the power to refer the recipient to Mandatory Work Activity. The placement will be for up to four weeks and aimed at helping the recipient develop the labour-market discipline associated with full-time employment such as attending on time and regularly, carrying out specific tasks and working under supervision. "18. Requiring a small group of recipients to engage in full-time activity will give them the opportunity to demonstrate their compliance with the Jobseeker’s regime. If a recipient fails without good cause to attend or complete the placement, then we will impose a significant financial sanction. This could be, for example, withholding Jobseeker’s Allowance for at least three months." And you thought it was too late for Nineteen Eighty-Four. "a. Failure to meet a requirement to prepare for work will lead to 100 percent of payments ceasing until the recipient re-complies with requirements and for a fixed period after re-compliance. "b. Failure to actively seek employment or be available for work will lead to payment ceasing for four weeks for a first failure and up to three months for a second. "c. The most serious failures that apply only to jobseekers will lead to Jobseeker’s Allowance payment ceasing for a fixed period of at least three months (longer for repeat offences). Actions that could trigger this level of penalty include failure to accept a reasonable job offer, failure to apply for a job or failure to attend Mandatory Work Activity." Be very afraid. And expect a good deal less young or not so young entrepreneurs, authors, actors, musicians, thinkers and artists having the time to do anything creative any more. Or so say the New Zealand Institute of Economic Research (NZIER), our largest and most influential economic think tank, in their report on Lifting Export Performance published last month. Hmm, a fair bit of social spending assists families to buy forms of agricultural produce (that is food), and that's New Zealand's number one export, so the argument is at least partially, if not substantially, flawed. Wow, so social spending is a "tax on exports". I always knew NZIER focussed only on economics rather than on a more holistic view of life and living standards, but I also thought it was somewhat objective. Now I realise it's become a campaigning arm for the right wing economic viewpoint that spouts ever lower taxes on corporates, less regulation and less income sharing. These NZIER methods aren't going to grow anything other than harm and inequality. If we want growth, we should encourage sharing, because if everyone benefits from growth, then everyone will contribute to it. And what the Hell is wrong with Government investment in "rail or banking"? If the government hadn't invested we wouldn't have a rail network, airline or highly successful New Zealand bank. What’s the point of the new Ministry of Business, Innovation and Employment? What sense is there in squeezing together the disparate organisations of Building & Housing, Science and Innovation, Health & Safety, Employment Relations, Immigration, and Economic Development into one ‘super’ ministry? Joyce says that, “the new Ministry of Business, Innovation and Employment will help the Government’s business growth agenda by implementing integrated policies to build a more competitive and internationally-focused economy”, but if we want joined up policy across government and industry sectors, let’s create a central policy think tank that can operate across government and sectors, like the private think tanks do; let’s not unify the operational arms of disparate organisations to make a super organisation – that’s just plain dumb. Joyce says that, “at present when businesses engage with government they work with multiple government agencies, which takes away valuable time, as well as incurring unnecessary duplication of effort.” But this is rubbish. New Zealand has the greatest ease of doing business of anywhere in the world. The idea that we don’t, and that this needs to be corrected, is a myth, a straw man that Joyce has erected as another excuse to proceed with his damaging pet project. We all know that big, diverse organisations don’t work well; while small, lean organisations do. The private sector does poorly when it lumps together diverse corporations, and so does the public sector. MBIE isn’t a giant oil company, multi-national food product producer or media conglomerate, it doesn’t have the commonality of business that these large organisations need to succeed. MBIE should not be; the diverse organisations that comprise it should stay separate, and in fact should separate further to be leaner, more efficient organisations highly specialised in their fields of operation. Joyce’s idea that MBIE will be, “a single focused business-facing government ministry,” is ludicrous - it’s not desirable to have such a single focus even for economic development, let alone science, innovation, health, safety, immigration and employment relations. The point of government is to enable the fulfilment of every member of society, and that isn’t achieved through focussing only on business. And even if every organisation had a single, common, over-arching focus of fulfilment without harm for everyone, that still wouldn’t require merging these organisations physically into a giant one. No, specialised, separate organisations work better, even, in fact especially, when they share a common purpose. In short, the MBIE merger is unnecessary, and what's worse, a lot of people are going to be hurt because of it – just what government shouldn’t be doing. Why Is Key Right & Wrong? He’s right because he believes everyone wants to be completely individual and independent from the state, but he’s wrong, because he believes this can happen naturally within capitalism. It can’t. Capitalism doesn’t distribute incomes equitably. It requires a shared base income so that everyone has the opportunity to make their best contribution at every stage of their lives. This doesn’t require greater government, it requires greater income sharing. There's a difference. If government organisations only did what needs to be done, a lot less effort would be wasted, they would be far more efficient, and very many less hours would be required to get necessary and timely work done. Instead most public sector managers focus on trying to do as much as possible to ‘prove themselves relevant’ to ministers. Most of this work never reaches the minister. Most of the work is done before it needs to be done, and when it comes time for some work to be done, it is found that the work done before it was known what was needed, is irrelevant. That is the danger of second guessing what needs to be done before it is needed and doing it immediately – this work is almost always wasted effort, but most public sector managers can’t resist doing ‘anticipatory’ work. It’s also why most of the public sector doesn’t become more efficient on its own, because most public sector management keeps on making more and more work for itself in anticipating work, that in the end, actually never needed to be done. 'If you are highly educated and older you likely get paid more, and if pay is a proxy for productivity, then you are by definition more productive.' Economic thinking. Of course by that thinking, finance is also the most productive industry sector, because they pay themselves the most (and volunteers are entirely unproductive). This chart indicates what could well be something of a concern for those in New Zealand. Click on the chart to see it larger. Clearly employee compensation is much less in New Zealand than in the US and UK, and has been that way since the sharp decline of the 80's. Couple that with much smaller GDP per capita and we get a rather poor situation for little old New Zealand. Don't cycle so fast a car door opening would cause you serious injury, especially wherever there is only a narrow gap between parked cars and moving traffic, which is pretty much anywhere in the central city and surrounding suburbs. It just isn't worth it. In fact, wherever possible, keep away from roads where there's little space for cyclists, and avoid times where there's a great deal of traffic. If isn't safe, and you can't do it safely, don't do it. Plugging The Gap (NZ Institute) || Food & Tourism...? "The difficulty for firms trying to build successful international businesses is that the domestic market here is very small so that businesses are small when they begin to export and the markets they serve are distant. That means their capability and resource base is relatively low when they internationalise and the cost to establish in offshore markets is relatively high. Those difficulties often cause delays that consume capital and erode competitive position." "The business must have a product or service that is appealing enough to win customers and those customers must be willing to buy from an emerging business that is headquartered a long way away. It must be able to deliver the product or service at a competitive price and have costs that are low enough to provide an attractive margin." "The current ecosystem is not delivering sufficient talent and capital to the internationalising businesses so the businesses are not as successful as they could be. Some are being sold overseas when the value created could otherwise be held in New Zealand." Rick Boven (2010), Plugging The Gap – An Internationalisation Strategy, New Zealand Institute. There has to be a reason why a product is produced in New Zealand, with agriculture it's obvious: the conditions are just right and arable land is relatively plentiful. Produce a product that can be produced more easily elsewhere, and the market is elsewhere, then production will move. In short, unless production in New Zealand delivers some form of advantage, production will move. 'Clean & Green' ('Pure') are probably our greatest brand assets. These gel well with food production and sustainable tourism. There is no particular limit to the diversity of food product or variety of tourist experience that we can produce. We would do well to play on this. If we work to New Zealand's strengths we will most likely succeed in overseas markets and still produce here. It's not gross domestic product per worker, it's the monetary value of product per worker, which is quite a different thing from product per worker. On product per worker I have no doubt New Zealand would be very much the same as Australia. By measuring everything in dollars we fall down on the things that are actually important to us, like making a meaningful contribution and finding fulfilment in what we do. New Zealand's natural products have not done well (in dollars) because other countries have subsidised a glut on the market. Now the market has grown (in world population and affluence) and even those extensive subsidies are not enough to encourage supply great enough to keep prices down. "Key [New Zealand Prime Minister] would improve the odds if he were to add authority to likeability, put his stamp on the government as well as be its face. Authority would require that when he says something it is the government speaking, not John Key musing. It would require that when a minister does something, it is the action of an unmistakably John Key minister, not of someone who happens to be in the ministry." This is rubbish. It is his qualities of approachability and good nature that contribute the greatest part to his likeability and his popularity (along with his clear capability). His authority is without question - he is the Prime Minister. The idea that a position of authority must entail an authoritarian attitude is a nonsense. In the sense that he is collaborative, constructive and willing-to-talk he embodies the qualities that are vital to anyone being popular in the new politics. The old authoritarian 'strong leader' is largely dead in modern Western politics (or so most of us hope), just as it is dying in modern Western corporations (though not as quickly as many of us would wish). Right or wrong, corporate multinationals actively kowtow to the interests of America. It must be pretty hard for Siemens to be trusted again as a software provider. Where's the legality of this? It isn't debated. Because of cause the actions are never admitted. It's obviously illegal, domestically. But internationally, the laws are weak, and what's been ruled right, has often been might. Sometimes some harm has to be done to prevent a greater harm. I guess this is the essense of the best argument used. But is this the case here? Is American-Israeli sabotage of Iranian nuclear facilities the lesser harm against Iran's rhetoric about Israel? Is murder of scientists? Adversarial politics seems to be the only politics Phil Goff knows. Whatever National does, count on Phil Goff to criticise it and find fault. Phil appears to have only one style, and that's the old politics of win or lose. But a good leader demonstrates constructive, collaborative behaviour. That's the way we want to be led and the way we want to be treated. The continuous sniping is the old politics, the tired politics, the foolish and stupid politics of no good purpose, played as a game for winners and losers. We're past that now, why isn't Goff? I've been a Labour supporter, but Key, and many of his cabinet (not all), are the better leaders now. I only post this because I want Labour to do something constructive. Wikileak's cables leak puts the state of affairs in a better light than the media does. Perhaps the establishment shouldn't find releasing the truth so scary. But then again, we can probably always rely on the media to distort whatever they say (jazz it up, sensationalise it, speculate on it, etc).